Hannah believes in true client satisfaction. Her personal touch means that no foot problem is too big or too small. Every treatment is thorough making sure that you get the best result possible. 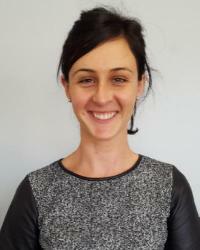 Since completing her studies at Charles Sturt University in 2009, Hannah has worked in a range of clinical settings including rural remote and metropolitan areas. She has also worked abroad in the UK for 2 years with the National Health Service and in private clinics. During this time, she developed a specialist understanding of the diabetic foot and its complications. While working in private clinics Hannah has helped a wide range of people to overcome conditions including sporting injuries, special podiatry concerns and paediatric complaints. Hannah has a strong understanding of all aspects of podiatry with extensive exposure to walking and running posture she will confidently help you with sporting activities. She also provides an extremely thorough general treatment and is very confident her customers will feel like they’re walking on air when they leave the clinic. Diabetic patients, in particular will undergo an in-depth diabetic lower limb assessment.